Joyce Ruf, age 82, passed away peacefully with her son holding her hand on Thursday, June 21, 2018 at the Meadows, House 13 in Swift Current, SK. Joyce Marie (nee Wittman) was born July 10, 1935 to Fred & Martha Wittman in Prairie View, SK, where she grew up on the family farm with her younger brother, Raymond. Joyce was baptized and confirmed at the Peace Lutheran Church, Prairie View District. She was kept busy with the daily chores around the farm and attended Turnhill School and Beatty Collegiate in Swift Current. It was during the many rides into the city with Herman “Herb” Ruf for piano lessons that a romance blossomed, and they were married on November 8, 1953. Herb & Joyce moved into the store house and started working along side his brothers at Ruf's General Store in Prairie View. During their years at the store, they adopted and welcomed two children — Lorelei and Mark (Jeff). In 1965, they moved to Waldeck, SK so Herb could open his business, Herb's Electric. During those first few years in Waldeck, Joyce was kept active looking after their two young children — Lorelei especially being quite the handful. Once the children started school, Joyce began working in the shop doing the book work. Joyce became an active member in the small village of Waldeck, taking on a leadership role of bringing Parks & Recreation activities to the young children, along with planning Dine & Dances and Snow Mobile Derbies for the adults. She was recognized by the Lt. Governor for her accomplishments, receiving the Volunteer Service Award during Canada’s 125th Celebration. There was always something to do in their small hometown. Joyce never sat idle in the evenings, she enjoyed crocheting, baking bread and making desserts — their door was always open for friends and family to stop in for a meal, or just a coffee and a conversation. Much laughter could be heard coming from the kitchen table, especially when the neighbours or family came over to play cards. Herb closed the business in 1976 to return to farming. It was then that Joyce began working at the Pioneer Co-op in Swift Current and commuted to work from either Waldeck or the farm. She decided to retire in 1982 to be Herb's helper at the farm. From then on, she was tending garden, canning, making jams and jellies, and of course, handing Herb the necessary tools while fixing the machinery. Every Sunday, Joyce & Herb would be at church and continued worshipping over the years either at Peace Lutheran, St. Olaf's, and finally at Mt. Calvary Lutheran Church. They made sure their children were brought up in a Christian home knowing that Jesus was their Lord and Saviour. In 1991, Herb retired from farming and rented the land to the Waldeck Hutterites, but that did not stop them from living at the farm from spring until fall tending their large garden. It was during that time Joyce & Herb would travel to visit their children and grandchildren, or sometimes take a bus trip to the United States or a destination closer to home. Joyce loved her children very much and took great pride in all their accomplishments. She was especially thrilled to become a grandmother and then a great-grandmother to Lorelei's daughters, and, of course a "granma" to Jeff's whippets. Music was also very special in their home — many evenings were spent with Jeff at the organ, Joyce on her guitar, steel guitar, or keyboard while Herb played the saxophone or fiddle, filling the house with music. Joyce & Herb were active members of the Waldeck Golden Agers Orchestra and the church gospel band, they traveled to many nursing homes providing music for the residents. Joyce leaves to mourn her two children, Lorelei (Howard) Lawrence (Lloydminster, AB) and M. Jeff Ruf (Regina, SK); her grandchildren, Kimberly (Lyndon) Mayuk (Estevan, SK) and Krystal Lawrence (Lloydminster, AB); her great-grandchildren, Aspen and Ellise Mayuk and Kohl Lawrence; her brother, Raymond (Julene) Wittman; her sisters-in-law, Lena Ruf and Lorna Ruf; and by numerous cousins, nieces, and nephews. Joyce was predeceased by her loving husband of 60 years, Herb Ruf; her parents, Fred & Martha Wittman; her parents-in-law, David & Margaretta Ruf; her brothers-in-law, David Ruf, Jake Ruf, Hank Ruf, Willie Ruf, Sam Ruf, Adam Ruf , Karl Ruf, and Herman Biesel; her sisters-in-law, Rose Biesel, Anne Ruf, June Ruf, Emma Ruf, Ella Ruf and Vi Ruf; her nieces, Eunice Robertson and Elaine Smith; her nephews, Don Robertson and Bruno Miller; many aunts and uncles; and by countless friends that went before her to welcome and celebrate her arrival in heaven. Lorelei and Jeff want to thank the nursing staff, doctors, and care aides at the Meadows, House 13 for the care and compassion they extended to Mom during her five months there. We also want to express our gratitude to Brenda at the Willows at Riverview for being her friend and keeping us updated during those months of care. We also want to give thanks to our family and friends for their outpouring of support during this difficult time. We also want to acknowledge the Swift Current Funeral Home for taking good care of Mom until we lay her in her final resting place. The Celebration of Life for Joyce Marie Ruf was held on Tuesday, June 26, 2018 at 11:00 am from Mt. Calvary Lutheran Church, Swift Current, SK with Pastor Brad Julien officiating, with Arlie Neufeld serving as pianist. Tributes were given by Pastor Brad Julien on behalf of the family. The ushers in the church were Doug Ruf and Burt Rempel. The Interment Service was held from Peace Lutheran Cemetery, Prairie View District, SK with Brent Wittman, Doug Robertson, Steve Ruf, Mike Ruf, Lyndon Mayuk, and Larry Belter serving as Pallbearers. 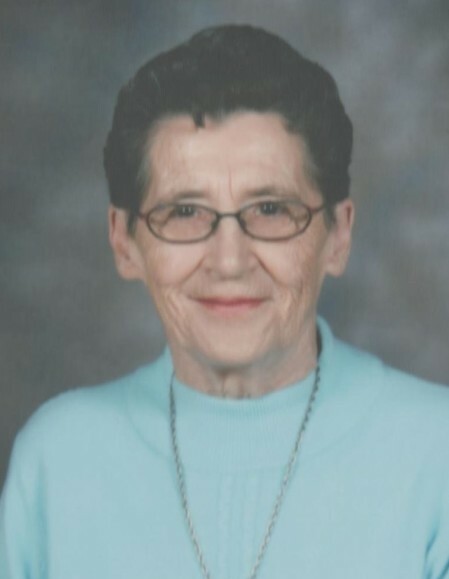 In memory of Joyce Marie Ruf, donations made to the Peace Lutheran Cemetery Fund would be appreciated by the family.